Consider Nick and Nigel Bottom our forefathers. Together with a ragtag crew of theater enthusiasts, they overthrow the burdensome British dramatic influence, invent the musical art form, and escape to America to allow the musical to flourish. Of course, this is a fictive account of Broadway’s birth. But hey, The Aeneid is a fictional version of Rome’s founding and King Arthur probably looked nothing like Clive Owen. And I’m sure no one in the Second Continental Congress sang duets with John Adams. Our founders in Something Rotten! are two theatrical siblings in Elizabethan London looking for their next big hit. Nigel (John Cariani) is the playwright of the family while Nick’s (Brian D’Arcy James) role is similar to that of a producer. Their work, however, only meagerly survives in the shadow of the enormously popular Shakespeare (Christian Borle), a superstar rock god equipped with a metallic designed doublet, eyeliner, and plenty of swagger. Facing financial ruin, Nick visits a relative of Nostradamus (Brad Oscar), asks what the biggest trend in theater will be, and gets to work on the world’s first musical. And boy what a musical it is! Sorry, I mean Something Rotten!, not Nick’s musical. Nick’s soothsayer predicts that “Omelet” will be Shakespeare’s biggest hit (close enough to Hamlet), so Nick creates “Omelet the Musical.” It goes without saying that “Omelet” is terrible. Nick’s despair and lack of confidence in his and his brother’s creativity cause his failure. But Something Rotten! is the complete opposite of an uninspired, uncreative mess. It is a joyful, laugh-a-minute show, chock full with references to popular contemporary musicals, with a comedic energy we haven’t seen since The Producers and Spamalot first graced our stages. Oddly enough, these comedic tour-de-forces (Something Rotten, The Producers, and Spamalot) are all meta-theatrical. 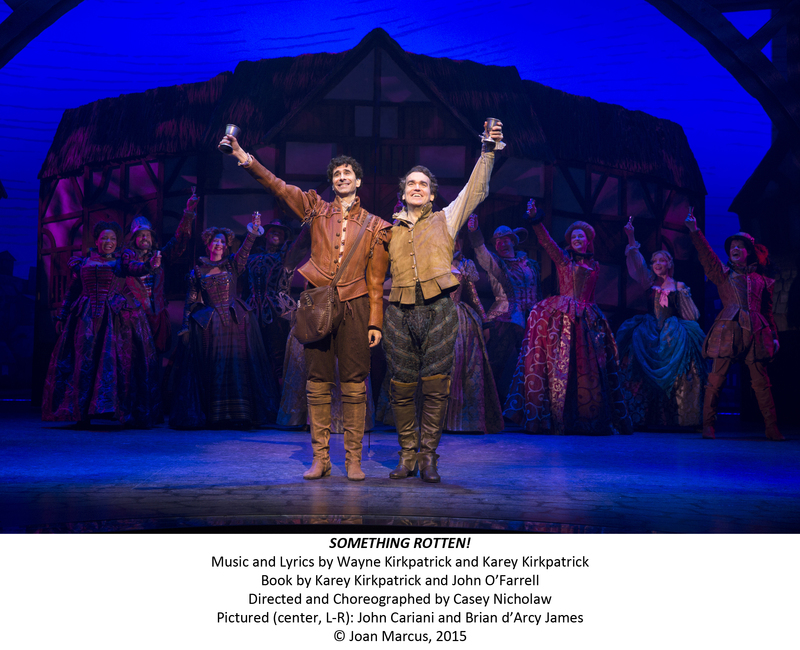 Both Something Rotten and The Producers are about the making of a musical, while Spamalot is full of self-aware glitz and humor (think “Diva’s Lament”). I’ve written before about the joy inherent in making the audience complicit in theater, and this is certainly an enormous factor in these shows’ successes. These shows cater particularly to a theatregoing crowd, uniting our common Broadway knowledge and experience that make us a dependable fanbase. But there’s also the fact that these shows are themselves textbook examples of great Broadway musical comedies. 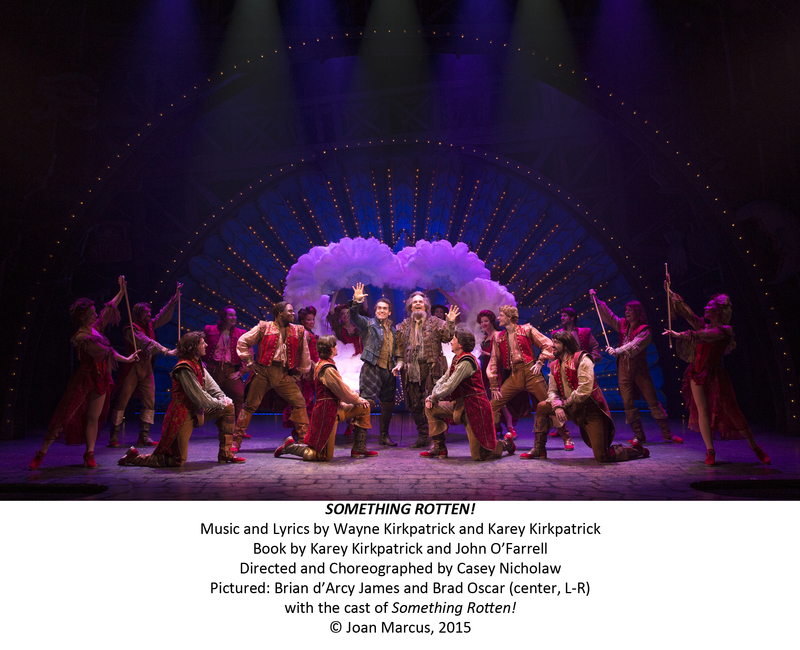 Something Rotten not only embraces the musical’s history and form, but it also practices it! There’s the colorful and ostentatiously exaggerated set (Scott Pask) and costume (Gregg Barnes) design, a hilarious and enormously talented cast, huge musical numbers (see “It’s A Musical”), and even an endearing side of romance. It’s the type of production that reveals how the musical is different from every other art form and how it came to occupy such an important and popular place in American culture. Something Rotten! is something every musical theater lover should get excited about, if not revere. It is hilariously creative, over-the-top, and often heartfelt–everything that uniquely defines the musical form. It restores our faith in this land we call Broadway, may it forever reign. For more thoughts on the show, click here to listen to our podcast!